HDMI ARC: What is Audio Return Channel and why should I use it? Is your home entertainment system as streamlined as it could be? Unless you’re using Audio Return Channel (ARC), probably not. Connecting your television and Hi-Fi equipment into one, seamless entertainment system can be a headache for the best of us, with seemingly endless piles of cables, connectors, remotes, and stress to get it all working. ARC is a type of audio transmission that links up your speaker output to your television controls, meaning you don't need a separate remote or interface to manage the volume. Sure, HDMI cables already carry audio from Blu-ray players, games consoles and set-top boxes into a TV. But with ARC, they can also send audio in reverse, from a TV into an external speaker or soundbar, without having to attach a separate audio cable. Ready to remove one more remote from your already way-too-complicated home entertainment setup? Here's how to do it. Why do we need ARC? ARC is an often ignored protocol sitting at the heart of almost all home entertainment products, and understanding ARC is all about knowing your ‘upstream’ from your ‘downstream’. The first thing to know is that, as a feature of the HDMI spec, ARC enables a TV to send audio signal upstream to a connected soundbar, a one-box home theater, or an AV receiver. It does this by first forming a 'handshake' between the TV and the audio device, creating a two-way street for information. By sending audio both ways, ARC does away with the need for optical audio cables (also called S/PDIF), cutting down on pointless clutter that likely already causes your a headache at home. Put simply, ARC is a cable-killer. Probably. Although you do have to have a TV with a special ARC-ready HDMI slot, almost all TVs have had such a thing for years. To find it, look at your TV’s string of HDMI slots, and you’ll see that at least one has a small reference to ARC next to it. 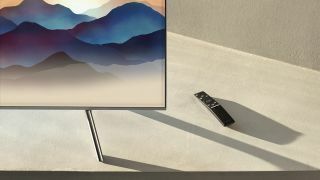 “An ARC-enabled TV can either send or receive audio via HDMI, upstream or downstream, depending on system set-up and user preferences,” says a spokesperson for HDMI Licensing who spoke to TechRadar. Usually it’s automatic; use the ARC-ready HDMI slot on a TV and you will automatically be able to send audio to any soundbar with an HDMI input. Thankfully, there’s no delay, either: lip-sync functionality was introduced in HDMI 1.3 to ensure that audio stays perfectly matched to video. It automatically compensates for any processor delays whether the audio is traveling upstream or downstream. What's the difference between ARC and eARC? The next version of ARC, Enhanced ARC (eARC) is about vastly increasing the bandwidth for an expected surge in audio data. Basically, it handles more advanced audio formats and higher audio quality. To that end, the surround sound we listen to is being substantially upgraded. Whether you’re listening through a 5.1 system with separate speakers, a soundbar, or via headphones, more immersive and nuanced audio is coming. So ARC is evolving to handle it in the upcoming HDMI 2.1 specification. “eARC simplifies connectivity, provides greater ease of use, and supports the most advanced audio formats and highest audio quality,” said the HDMI spokesperson. HDMI 2.1 is the latest update to HDMI, which is all about higher video resolutions and refresh rates. As well as being built to handle the next generation of video – 8K Ultra HD – at 60 frames per second (fps), HDMI 2.1-ready TVs, Blu-ray players and games consoles will be able to handle higher frame rates up to 120 frames per second for 4K video. HDMI 2.1 cables’ bandwidth will be upgraded from being able to handle 18 Gbps to a whopping 48Gbps. How big a deal is eARC for audio? In terms of bandwidth, it’s very big: A current HDMI cable can carry 1Mbps of auto data upstream and downstream; eARC takes that to a mighty 38Mbps. Critically, eARC is compatible with immersive audio formats including DTS Master, DTS:X, Dolby TrueHD and Dolby Atmos, formats home theater aficionados have been demanding for years. It also makes possible eight channels of 192kHz/24-bit sounds, making hi-res audio possible. As well as being about audio, eARC is about making all devices that use HDMI interoperable with each other. That’s a job formerly attempted by Consumer Electronics Control (CEC), a device discovery protocol that has been in HDMI cables from the very start. However, beacuse CEC was not a core feature of HDMI, it’s under-used. So eARC removes CEC altogether and instead puts device discovery on a new eARC data channel. Pretty neat, right? Should I wait for HDMI 2.1 and eARC? If eARC seems tempting, know that you might be waiting a while because devices certified with HDMI 2.1 slots and HDMI 2.1 features – including eARC – will not appear until 2019. But it's not all bad news: Some AV receiver manufacturers (notably Marantz) have already said they will offer eARC via a firmware update to AV receivers that don’t have HDMI 2.1. If cutting down on remotes for your next high-end sound system is a priority for you it's worth considering, but if you're content with the already-great 5.1 or 7.1 sound you're used to hearing, now is as good a time as any to buy audio products.